The British economy is slowing markedly. This has almost nothing to do with external forces such as China. 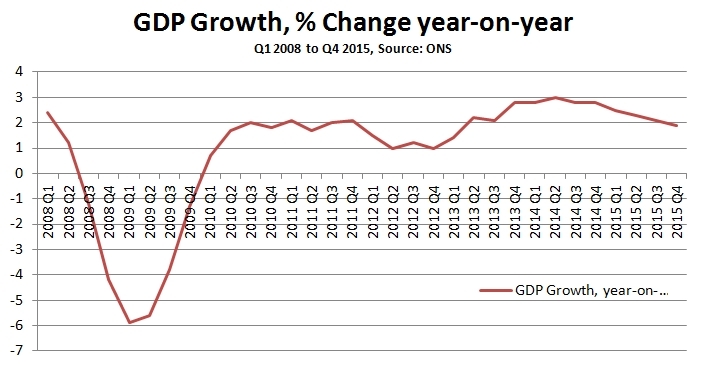 The slowdown is a consequence of Tory economic policies which have now failed twice. We are about to begin the third failure in succession with the further imposition of austerity policies. By contrast the economic framework outlined by Jeremy Corbyn and John McDonnell has the capacity to develop into a winning alternative. The GDP data for the 4th quarter show a marked slowdown in the pace of the growth. Fig.1 below shows the pace of year-on-year growth by quarter. The year-on-year data smooths out its volatility from one quarter to the next. On this basis the growth in real GDP slowed to 1.9% in the 4th quarter of 2015. This is a decline from 3% growth in mid-2014 and the slowdown has been continuous since that time. This represents a double failure for Osbornomics. 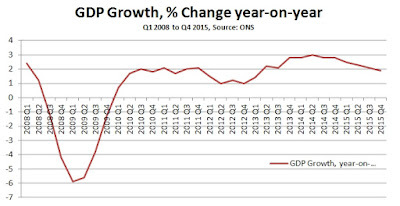 As the chart also shows, the economy slowed significantly after the Tory-led Coalition took office in 2010 as the growth rate slipped from 2% to 1%. This was the effect of the austerity policies. But the second failure was the so-called ‘recovery’. This was the boost to consumption from 2013 onwards in order to get the Tories elected. It was a classic type of Tory boom (even if it passed most people by). It boosted the price of houses (and so increased consumption) but not house-building (which would require investment). All consumption-based upturns fade unless they are least matched by rising investment. This is what is now happening in the British economy. Osbornomics has failed twice; austerity slowed the economy to a crawl and the ‘recovery’ was bound to fade because it was driven by unsustainable growth in consumption. Meanwhile, Osborne has made it clear that he will reimpose austerity measures, this time using the pretext of renewed economic weakness he has fostered! So that is what should be expected in the March Budget. A recovery in investment remains the key to reviving the economy on a sustainable basis. Osborne previously promised a ‘new economic model’ in 2010, which would rebalance the economy. He argued, correctly, that, “The economics profession is in broad agreement that the recovery will only be sustainable if it is accompanied by an internal and external rebalancing of our economy: in other words a higher savings rate, more business investment, and rising net exports”. He has failed on all counts. The table below shows these three variables in 2008 and in 2014. A key symptom or consequence of this fundamental failure is the failure to ‘rebalance’ the output of different sectors of the economy. This is shown in Fig.2 below. While the total level of output is above its pre-recession peak the only sector of the economy which has recovered is services. This is entirely in line with the weakness of savings and investment. Production, manufacturing and construction all require fixed investment to increase, or even to stabilise. Likewise, a rate of investment which is below competitors and which is not recovering presents an obstacle to any sustained increase in exports. The Osborne tactic of boosting consumption in order to get re-elected tends to work in the opposite direction as imports rise faster than exports. These fundamental failings explain why Corbyn and McDonnell are right to focus on an investment-led recovery. They are also right to borrow for Government investment and to aim for a balanced budget on current spending, financed by stronger growth and, where needed, taxation. The failings of the British economy are long-term and since 2010 the Tories have exacerbated them. It is also clear that these myriad difficulties will require both radical and detailed policies from Labour in order to address them. The centre-piece of that programme is a series of policies that will lead to a substantial increase in the rate of investment. A major discussion is taking place in China on the issue of its economy’s ‘supply side’. Naturally there are aspects of this which relate to specifically Chinese issues. Discussion in China also differs fundamentally from that in the West in that it takes place simultaneously in both ‘Western’ and ‘Marxist’ economic terms. Nevertheless the overall framework of this discussion equally relates to the key issues of economic policy in Western countries. The article below, which originally appeared in Chinese at Guancha.cn, therefore is simultaneously a contribution to discussion on China’s growth rate targets, and forthcoming 2016-2020 13th Five Year Plan, as well as overall issues of economic growth. It thereby deals not only with specifically Chinese issues but with ‘growth accounting’ as developed in Western economics, the real positions of Keynes as opposed to the confusions of what is generally referred to as ‘Keynesianism’ and the most powerful factors in economic developed. While its specific focus is China this makes clear why the current discussion in China is crucially related to overall questions of economic analysis and theory applying in other countries. Economic laws are objective – China is no more capable of breaking them than any other country. Consequently, policies which do not correspond to these laws and the forces they analyse simply will not succeed. This is the context for discussion of China achieving ‘at least 6.5%’ growth which is necessary to make the transition to a ‘moderately prosperous society’ by 2020. It particularly applies to some recent discussion which took place in China’s media on ‘supply side economics’. At one level, for reasons analysed below, this focus on the supply side is a positive break with the confused ideas of so-called ‘Keynesian’ economics imported into China from Western economic textbooks – although in fairness it will be seen that such views are not actually those of Keynes. But unfortunately some of this new discussion entirely fails to accurately understand the very different strength of different factors on the economy’s ‘supply side’ - erroneously proposing policies relying on very weak supply side forces which would therefore make it more difficult to achieve ‘at least 6.5%’ growth. This article’s aim is therefore to simultaneously show why concentration on the economy’s supply side is correct, to analyse accurately the most powerful forces on the supply side using up to date official statistical methods, and examine the conclusions which flow from the relative strength of different factors on the economy’s supply side. Demonstration of why concentration primarily on the economy’s supply is correct can be made in either Marxist or ‘Western’ economic terms. The Marxist one is more succinct, and will therefore be dealt with first, but it will be demonstrated that analysis in either economic framework leads to the same conclusion. Marx consequently states that other elements of the economy – demand, consumption, exchange etc. – have some influence but that production, the supply side, is the most powerful economic factor. Analysis shows why this is clear. Consumption, for example, can only be undertaken either of one’s own production or with an income to purchase products, and that income necessarily comes, directly (wages, profits) or indirectly (welfare benefits, pensions, support from another family member etc. ), from participation in production. Furthermore, Marx’s analysis does not deny the interaction of supply and demand, which is the focus of ‘Western’ economics, but simply asks a different question: if supply and demand balance, that is there is ‘equilibrium’, what happens, what is the economy’s dynamic and how does it develop? Marx, in summary, was a thoroughly ‘supply side’ economist. The economic school which focuses on the economy’s ‘demand side’, as opposed to supply side, is generally referred to as ‘Keynesianism’. The argument associated with this is that if economic difficulties exist this is due to lack of demand, which should therefore be increased – frequently by running a budget deficit and/or monetary easing. This increase in demand, it is argued, will lead to production increases. This argument is evidently false. In a market economy production is not undertaken simply because something is ‘demanded’, it is only undertaken for profit. If an increase in demand leads to no increase, or even a decline, in profit then it will not result in an increase in production – indeed it can lead to the reverse. There are numerous conditions in which increasing demand will not lead to a profits increase. One is where the economy has no spare capacity and therefore production cannot be expanded on the basis of existing resources. In this situation increasing demand, with no ability to increase supply, merely leads to inflation and not a production increase. But an increase in demand can lead to a fall in profitability even where spare capacity exists. For example, if increased demand strengthens the bargaining position of labour, thereby increasing the wages share in the economy, the profits share in the economy must necessarily fall and profits may even decline in absolute terms. In those circumstances increasing demand, through its negative effect on profitability, will have a negative effect on production. Some policies to ‘increase demand’ even directly reduce profitability - for example if the increase in demand is achieved by directly increasing wages then the profits share of the economy will fall. It is therefore simply false that increasing demand necessarily leads to an increase in production - it may even lead to a fall. In practice methods of stimulating demand may lead simultaneously to the combination of inflation and economic stagnation or decline – the notorious ‘stagflation’. Naturally these facts do not mean there are no circumstances in which increasing demand will lead to an increase in production, but whether this occurs or not depends not on increased demand itself but on its effect on profitability – i.e. the division of incomes between wages and profits resulting from production. Profitability, not ‘demand,’ is therefore the key part of the economic process. It summary, whether analysed in a Marxist or ‘Western’ economic framework, the most powerful element is the supply side of the economy not the demand side. This does not mean demand has zero effect, but it means that the effect of demand is less powerful than that of supply. Consequently, what is often referred to as ‘Keynesianism’ is false – the point that should be added is that such ‘Keynesianism’ is a distortion of the views of Keynes himself as Keynes perfectly well understood that profits were the element determining production in a market economy. Turning to which processes are most powerful, and which are weak, on the economy’s supply side it is a testament to genius that modern econometrics has confirmed on this issue the analysis over 200 years ago by the founder of modern economics Adam Smith. Smith set out immediately and unequivocally in the first sentence of the first chapter of The Wealth of Nations that: ‘The greatest improvement in the productive powers of labour, and the greater part of the skill, dexterity, and judgment with which it is directed, or applied, seem to have been the effect of the division of labour.’ With his customary clarity the other conclusions of Smith’s magnum opus followed logically from this analysis of the decisive role of division of labour. Smith’s conclusion has necessary consequences which impact on the all aspects of the economy. This increasing division of labour means that as Spengler notes in his study of The Wealth of Nations: ‘in Bohm-Bawerkian terms... production became more roundabout.’ By ‘roundabout production’ is meant that rising division of labour creates an increasingly interconnected web of production, and therefore that economically ‘indirect’ inputs rise relative to ‘direct’ ones. To illustrate this with a simple example, 100 years ago an accountant merely used a pen, paper and a simple calculating tool which were the product of, in comparative terms, relatively few people. Today an accountant uses a computer, software, and the internet - collectively the product of hundreds of thousands of people. To take a quantified example, a modern car assembly factory may appear a huge productive unit, but only 15% of the value of the car production process takes place in it: 85% of the value of auto production is in components and other intermediate inputs into car production. Furthermore, even the 85% of the car’s value due to inputs of components does not exhaust this process of division of labour and of ‘indirect’ inputs. These components were themselves improved by the work of tens of thousands of R&D workers and scientists, who were trained by hundreds of thousands of teachers, university lecturers etc. This process of increasing division of labour perfectly demonstrates the process analysed by Smith. At this point Marx enters the picture. Marx summarised the numerous different processes of division of labour described by Smith in a single fundamental concept ‘socialised labour’. Marx drew out the conclusions which followed from the fundamental processes analysed by Smith. But for present purposes it is not necessary to deal with these further conclusions or even to distinguish between the terms ‘division of labour’ used by Adam Smith or ‘socialised labour’ used by Marx – they both described the same process. It is merely crucial to note that modern economic statistics has thoroughly vindicated in quantitative terms these conclusions of Smith/Marx and thereby established what are the most powerful forces on the economy’s supply side. (i) The most fundamental force of economic and productivity growth is increasing division of labour – reflected in the growth of ‘intermediate products’. (ii) Increasing division of labour requires an increasing scale of production and an increasing scale of market – resulting in globalisation. (iii) Increasing division of labour, and increasing scale of production, leads to an increasing percentage of the economy being devoted to fixed investment. (iv) Growing skill of the labour force, i.e. increasing ‘labour quality,’ is economically determined by the resources put into training that labour force. (v) Technological progress is itself also a product of increasing division of labour via establishment of specialised R&D and other facilities. As with all proper scientific propositions Smith’s conclusions are empirically testable. It is a remarkable tribute to Smith’s genius, and that of Marx who understood their power and built on them, that modern economic statistics has confirmed all these points. They will, therefore, be analysed, using modern official statistical methods, proceeding from the most powerful forces on the economy’s supply side to the weaker ones. The most direct measure of division of labour is growth of ‘intermediate products’ – i.e. production of one economic sector, either goods or services, used as an input into another (e.g. a hard drive is an output of one industry used as an input into a computer, a steering wheel is the output of the car components industry used as an input into the car industry etc.). Modern econometrics is unequivocal in finding that such intermediate products, directly reflecting division of labour, are the most important source of economic growth. For Taiwan Province of China, analysing 26 sectors in 1981-99, Chi-Yuan Liang found regarding intermediate material inputs: ‘Material input is the biggest contributor to output growth in all sectors during 1981-99, except… seven’. This analysis that growth of intermediate products is the most important factor in overall economic growth therefore fully confirms Smith’s analysis that rise of division of labour is the single most powerful force on the domestic field for economic growth. This process fully operates in China as in the other economies studied. Intermediate products themselves constitute the largest part of international trade – accounting for approximately 40% of all goods trade. Trade in intermediate products is concentrated in advanced economies and East Asia - economies which have intermediate products as the most rapidly growing part of national production. International trade has expanded rapidly as a percentage of world GDP. That international trade is the expression of division of labour of course explains the well-established finding that international economic ‘openness’ is positively correlated with economy growth. (i) In both advanced and developing economies Total Factor Productivity (TFP) is only a small source of growth. TFP in advanced economies on average accounts for 0.5% annual GDP growth and in developing economies 0.6%. (ii) Labour inputs account on average for 0.8% annual GDP growth in advanced economies and 1.2% in developing ones. (iii) Capital inputs are the single most important of the ‘Solow’ factors of growth accounting on average for 1.6% GDP growth a year in advanced economies and 2.5% in developing economies. The net result of these inputs is that annual average growth in developing economies in the period 1992-2014 was 4.3% compared to 2.9% in advanced economies. This annual growth lead of 1.4% by developing economies allows them to catch up with advanced economies. But only 0.1% of the ‘catch up’ in GDP growth is due to higher TFP growth compared to 0.4% for higher increases in labour inputs and 0.9% due to higher capital inputs. Therefore, 64% of the ‘catch up’ of developing economies is due to a higher rate of capital accumulation, 29% due to higher inputs of labour, and only 7% due to higher TFP growth. To show more clearly the similarities and differences in the growth pattern of advanced and developing economies Figure 2 and Figure 3 show the percentage contributions to growth in advanced and developing economies. To highlight the most significant difference more clearly labour inputs have been divided into their two sources of increase in labour quantity (i.e. total hours worked by the labour force) and increase in labour quality (improvements in education and training). The charts show that the most powerful sources of growth in the two types of the economy are the same with one significant difference regarding the growth of labour inputs. (i) The role played by Total Factor Productivity is small in both advanced and developing economies, accounting for only 10% of growth in both. TFP is substantially determined by indirect inputs into production - technology advance due to R&D etc. (ii) The percentage of growth accounted for by labour inputs in both types of economy is not radically dissimilar – 26% in advanced economies, 30% in developing economies. However, the composition of the increase in labour inputs is substantially different in the two types of economy. In developing economies 27% of GDP growth is due to increase in total hours worked by the labour force and only 3% by increases in labour quality, whereas in advanced economies only 15% of growth is accounted for by increases in hours worked and 11% by improvements in labour quality. Therefore, as an economy becomes more advanced the role played by increases in total hours worked falls while the role played by improvements in education and training moves from being small to being a significant growth factor. Put in simple terms the role played by education, training etc. becomes significantly more important as the economy become more developed - a classic example of roundabout/indirect production as the increase in labour quality is due to the work of teachers, training schemes etc. (iii) Increase in capital investment is by far the most important of the ‘Solow factors’ in economic growth in both developing and advanced economies – accounting for 60% of growth in developing economies and 63% of growth in developed economies. It may be noted that the role of capital investment in an advanced economy is even greater than in a developing one. Capital investment is a pure ‘indirect’ input into production – both intermediate products and fixed investment are capital in accounting terms but intermediate products are used in a single production cycle while fixed investment is used up (depreciated) over numerous production cycles. i. The most powerful factor in economic growth is the development of intermediate products – a direct reflection of increasing domestic and international division of labour. ii. The second most powerful factor of production is capital investment – accounting for approximately 60% of the growth which is due to ’Solow factors’ of production. iv. TFP plays only a relatively small role in economic growth – accounting for about 10% of growth due to ‘Solow factors’ of production. The above data immediately shows why the views of some of those in China claiming to stand for ‘supply side’ economics are wrong. For example, Liu Shenjun claims that the key factor in economic growth is individual ‘entrepreneurship.’ The data on economic growth clearly shows this is entirely false. The impact of individual ‘entrepreneurship’ would be part of the growth that is not created by quantitative increases in intermediate products, capital or labour i.e. it would be measured as part of TFP growth. But as already seen TFP increase even taken as a whole is a small part of economic growth – in both advanced and developing economies total TFP increase accounts for only 10% of economic growth. Furthermore, TFP growth is no higher in advanced economies, where individual entrepreneurship is supposedly concentrated, than in developing economies. Consequently, even if the role of ‘individual entrepreneurship’ accounted for the whole of TFP growth in advanced economies, which is a wholly unreasonable assumption given the key role of technology, scale of production, R&D and other factors, it would be only one third as important as growth in labour inputs and only one sixth as important as growth in capital investment. Therefore, attempting to create economic growth based on TFP increases, let alone ‘individual entrepreneurship,’ is like attempting to drive forward a machine using only a tiny gear wheel, while not attempting to shift it using the far larger gear wheel of capital investment or even labour inputs. For simple quantitative reasons such a strategy evidently cannot succeed. To summarise again the sources of growth on the supply side of the economy are, in descending order of importance, intermediate products, capital investment, labour inputs, and TFP (with the contribution of individual entrepreneurship being even less than that of TFP). This has evident implications for what constitutes a ‘supply side strategy’ - which includes but is not confined to the following points. 1. Regarding the most powerful source of economic growth, intermediate products, domestically the maximum conditions have to be created for China to use the advantages of division of labour. The increasing size of China’s economy, by expanding the size of its domestic market, facilitates development of such efficient division of labour. Nevertheless, efficient functioning of the domestic national market, and domestic division of labour, requires large scale material underpinnings. China’s transport system for example, a crucial factor permitting division of labour, remains highly underdeveloped compared with the US. Length of road per capita in China is only 16% of that in the US, and length of railway only 7%. Compared to the US China’s logistics system is therefore extremely underdeveloped. Similarly regarding communications, again indispensable for efficient division of labour, the percentage of China’s population on the internet is only slightly over half that of the US. Programmes such as ‘internet plus vital’ are therefore vital not only for systematic upgrading of production but for permitting efficient functioning of domestic division of labour. 2. In terms of international division of labour. the effect of the international financial crisis has sharply reduced the share of trade in China’s economy. The percentage of exports of goods and services in China’s GDP fell from 35% in 2007 to 23% in 2014 and the share of imports from 27% to 19%. Trade data shows this decline has continued in 2015 – in summary China is making less use of international division of labour than previously. Purely on the basis of exploiting the growth advantages of division of labour the most powerful way to stimulate exports would be via RMB devaluation while simultaneously more rapid GDP growth would be the most effective way to stimulate imports. However, in setting the exchange rate other considerations than trade stimulation also have to be taken into account and therefore these have to be balanced with trade considerations. 3. As fixed investment is the most important ‘Solow factor’ in economic growth it is necessary for China to sustain a high fixed investment level. However, investment requires equivalent savings. The decline in China’s savings as a percentage of the economy since 2009, i.e. a decline in the percentage of the economy developed to supply of capital, has led to China’s interest rates rising significantly above those in the US, with negative economic consequences. Reviving China’s saving rate, above all by increasing corporate profitability, is therefore an economic priority if a high level of fixed investment is to be maintained. 4. The growing importance of labour quality, as opposed to labour quantity, as an economy becomes more developed underlines the importance of China continuing to increase the percentage of the economy devoted to education and training. 5. R&D is a crucial example of an ‘indirect’ input into production and is crucial for innovation. Continuing to increase the percentage of China’s GDP devoted to R&D is therefore important on the supply side. 6. Measures to assist individual entrepreneurship are useful but for the quantitative reasons already cited cannot play a determining or large role in economic growth. Given the clear facts on economic growth in both advanced and developing economies economists who claim that what is required on the ‘supply side’ is ‘"small government, big market", free competition and firm believe in entrepreneurship’ are both entirely wrong as regards the power of different factors on the economy’s supply side and are merely ‘neo-liberals’ hiding under another name – ‘neo-liberalism’ itself being so discredited that few people now dare to openly advocate it. Putting people at the centre applies to the productive process as in the other fields of the economy. The most powerful forces on the economy’s supply side is ‘socialised labour’, to use Marx’s terminology, or ‘division of labour’ to used Adam Smith’s – which terminology is used is not critical for present purposes as both describe the same process. The most powerful forces on the economy’s supply side as it becomes more developed – intermediate products, globalisation, rising fixed investment, increased labour quality – are themselves expressions of division of labour/socialised labour. The recent turn to emphasis on the economy’s supply side, as opposed to the confused ideas of ‘Keynesianism’ imported into some circles in China by Western textbooks, is therefore welcome. But it would be truly absurd if one Western textbook confusion were now replaced by another which constitutes merely a form of ‘neo-liberalism’ in other disguise. This would be particularly ridiculous when China’s Marxist economics and contemporary Western economic statistics come to exactly the same conclusion on what are the most powerful forces on the economy’s supply side. What level of investment should Corbyn & McDonnell aim for? The policies outlined by Jeremy Corbyn and John McDonnell have the capacity to transform the economic debate in Britain. More importantly, if the ideas outlined for an investment-led recovery are implemented then they could alter the trajectory of the British economy, from stagnation and rising inequality towards sustainable growth and a general rise in living standards. Therefore it is important to examine thoroughly what is the scale of the investment needed, which areas will be prioritised, what will be the overall effects on the economy, how it will be funded, and a number of other questions. Here, only an outline of the first question is addressed, what is the scale of the investment needed? The population as a whole is primarily concerned with its own well-being, on matters such as wages, health care, good schools, good quality public services and (for themselves at least) some reassurance that social security will provide sufficient support if they cannot work. In general these fall under the economic category of Consumption. SEB has shown over a number of articles that Consumption cannot drive economic growth. Consumption follows Production. Increasing Consumption alone simply leads to increased debt, a claim on future production. This is precisely what has occurred in the British and other economies since the crisis. Consumption has outstripped production and households in particular have been obliged to either increase debt or run down their savings. It is not sustainable. In order to increase production over the medium-term it is necessary to increase the means of production through Investment. Jeremy Corbyn and John McDonnell have said on a number of occasions that they will borrow to invest (audio link & transcript) but will run a balanced budget on current government spending. This is correct. Only borrowing to achieve a positive return and economic growth. It is this Investment (and borrowing to fund it) that leads to higher living standards, including higher Consumption. But it is precisely the level of investment which is currently the key drag on the British economy. 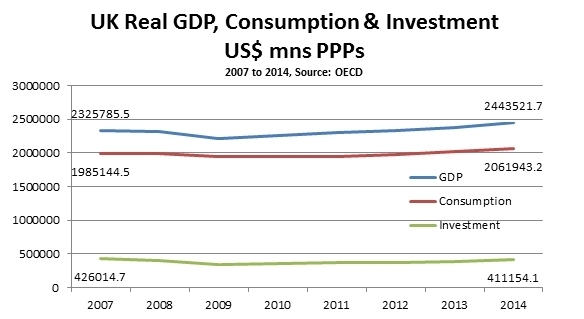 In Fig.1 below the level of real GDP, Consumption and Investment from the beginning of 2000 onwards are shown. Trend lines for GDP and investment are also shown as these show the general trajectory rather the more short-term fluctuations. One of the more ridiculous claims by the Tory Government is that its austerity policy is responsible for recovery. There has been no substantive recovery of the output lost in the slump. In most business cycles the sharpness of the recession is matched by the pace of the recovery. This business cycle is a rarity. None of the three key variables is anywhere near recovering its previous growth trend. As a result there is a risk that the loss of output will become permanent and the British economy will have shifted onto a long-term, lower growth trajectory. The most important of these three variables in determining future growth is Investment. If GDP growth had continued on its previous trend it would now be 16% higher than its current level. But Investment has experienced the sharpest fall, and is currently 26% below its previous trend. In fact Investment is the only variable to remain below its pre-recession peak, although that may alter in the near future. Because both the future level of GDP and Investment are unknown, it is impossible to say at this point what the precise level of additional Investment would be needed under a Corbyn-led Government. But it is possible to extrapolate from previous trends in order to demonstrate the approximate rate of Investment needed. This can be done by replicating the trend rate of growth from 1st quarter of 2000 over 8 years to the pre-recession peak in the 1st quarter of 2008. If that growth trend was repeated over the following 8 years, by the 1st quarter of 2016 real GDP (annual) would be £2,090 billion. From the previous peak Investment would be £390 billion. 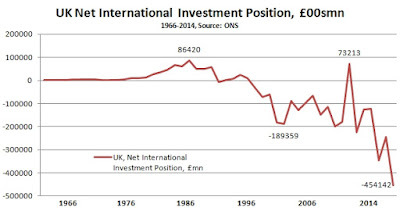 Investment is currently way below this level, around £310 billion. In the early part of 2016 it would require an annual additional increase in Investment of £82 billion in precise terms, from £310bn to return to trend growth rates. This would be an increase equivalent to 4% of GDP to 18.75% of GDP. As the private sector has been unable or unwilling to produce an investment-led recovery, the public sector will be obliged to lead this increase in investment equivalent to 4% of GDP. This is in addition to the current miserably low rate of net public sector of 1.5% of GDP, bringing the total level of net public investment (after depreciation) up to 5.5% of GDP. It is reasonable to assume that the private sector itself would then increase its own rate of investment to some extent, as the anticipated level of new profits would rise and based on past experience. But as this cannot relied on as the overall economic conditions at the outset of a future Labour Government are unknown, so this assumption cannot form a central part of the overall projection. The issue of how much additional investment is not exhausted by reference to previous trends, particularly since the British economy has had a lower rate of investment than comparable economies over the very long-term. Simply returning to 2000 to 2008 rates of investment is a minimum requirement in order to prevent permanently embedding the effects of the slump. Fig.2 below shows a comparison of labour productivity per hour in the UK and the rest of the G7 group of economies. 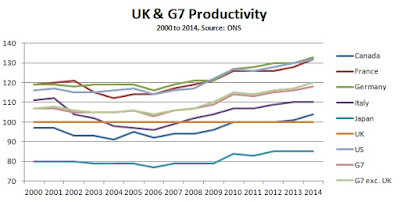 UK productivity is now over 20% below that of the rest of the G7, the highest productivity gap on record. 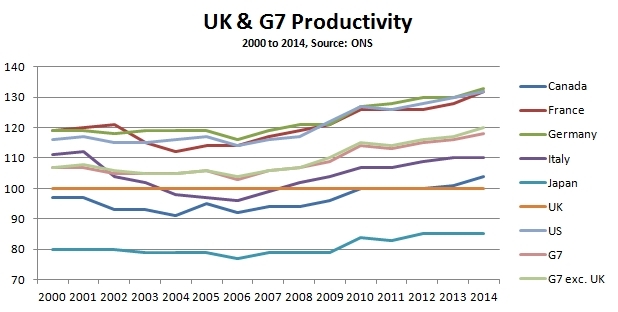 Since 2000 every country in the G7 has made gains relative to UK productivity. 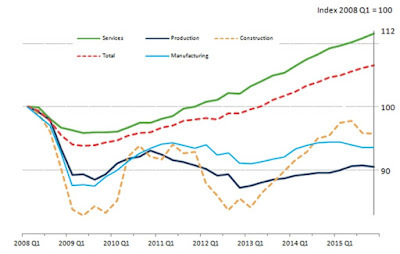 UK productivity has also fallen in the recovery, which is extremely rare. Usually, existing plant, factories and machinery that have fallen idle in the slump is brought back into production and productivity rises. Instead, labour inputs have risen as the UK economy has employed more people in longer hours in low value-added jobs, so output has not grown at the same pace. 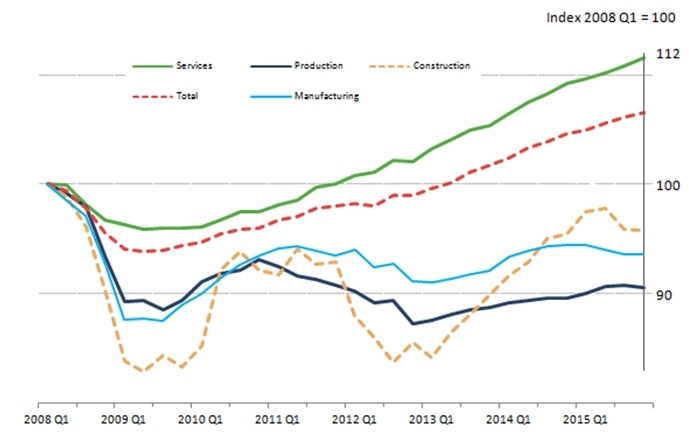 Despite much discussion there is no ‘puzzle’ behind the very weak level of UK productivity. It is because the UK has a very weak relative rate of investment. As the UK economy has a persistently lower level of fixed investment, so the relative decline in productivity is unavoidable. Productivity (labour output per hour) will increase in proportion to the increase in quantity and quality of machinery and other fixed capital used in output (as well as the skills level of the workforce). As Fig.3 below shows, throughout the entire period from 2000 to 2014, the UK economy had a lower proportion of GDP devoted to the investment (Gross Fixed Capital Formation) than the other countries of the G7. Furthermore the higher levels of productivity by country are closely correlated to their higher levels of investment. All other G7 economies gained on the UK in terms of productivity because they all had higher levels of investment over the same period. This relatively low rate of investment in Britain also accounts for the relatively weak competitiveness of the UK economy, including its large and growing external deficits. There is a widespread fallacy that it is cheap overseas labour which drives the deterioration in the UK trade and current account balances. But 80% of British goods exports are to other industrialised economies and 70% of its imports are also from those economies. Because Britain has much lower investment and productivity than those economies it runs a substantial trade deficit with them, approximately £60 billion per annum in the most recent data. The G7 economies as a whole have allowed investment to fall as a proportion of GDP. All of the G7 economies have experienced this fall, the sole exception being Canada. 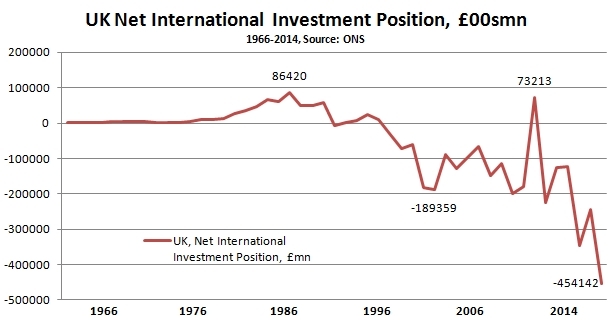 But the UK economy has throughout the entire period had the lowest rate of investment of all. The median level of G7 GFCF as a proportion of GDP has fallen from 23.7% to 19.5% in a short period, from 2000 to 2014. At the same time it has fallen in Britain from 19.9% to 17.1%. Therefore a supplementary aim should be to get the rate of investment in Britain up to the G7 average over the medium-term simply in order to prevent further declines in competitiveness. Osborne claims to be in favour of investment. But austerity is the latest manifestation of the neoliberal economic model which has held sway in the Western economies since Reagan and Thatcher. It is absolutely opposed to public sector investment because handing public sector assets to the private sector is a decisive means of boosting profitability. In this economic model, the means of production must be handed to private capital. Osborne is a subscriber to this view. As a result, public sector investment has fallen dramatically. On official projections from the Office for Budget Responsibility (OBR) the level of public sector investment will fall over the next three years (Table 3.6). Public sector net investment will fall to 1.4% of GDP in the last years of this parliament (Table 4.35). As noted above the additional level of public sector investment required under a Corbyn-led government would be approximately £82 billion, or 4% of GDP in order to return to previous trends. According to the OBR the total level of net public sector investment in the current Financial Year will be £33.6 billion (Table 4.15). However, this is after the deduction of depreciation of just under £40 billion. The gross level of public sector investment in the current FY is projected to be £73.4 billion. The required investment of £82 billion is in addition to this gross total, giving a total level of public sector investment need at £155 billion. Of course, not all of this needs to carried out by central government and still less needs to be funded by government borrowing. But this assessment is simply what is required in order to return to pre-crisis growth rates and would not even be sufficient to maintain current low levels of competitiveness versus the other countries of the G7. Equally there will be attempts to cast this analysis as ‘extremist’ or simply ‘unrealistic’. But it is no more extreme or unrealistic than the analysis of the chief economics commentator of the Financial Times, Martin Wolf in Cameron is consigning the UK to stagnation. ‘…the government… is refusing to take advantage of the borrowing opportunities of a lifetime…. It is determined to persist with its course, regardless of the unexpectedly adverse changes in the external environment. The result is likely to be a permanent reduction in the output of the UK”. In future posts SEB will examine where this investment should be concentrated, what its likely impact will be on growth and living standards, and how it could be funded, as well as other issues. “The second [pillar of my leadership] is a new economy that puts public investment front and centre stage: in science, technology and the green industries of the future. Instead of Osborne’s economic house built on sand, our focus will be on the reindustrialisation of Britain for the digital age, driven by a national investment bank as a motor of modernisation – and sustainable growth that will slash the welfare bill in the process”, Jeremy Corbyn writing in the Guardian. The economic policies of John McDonnell and Jeremy Corbyn are blowing away some of the accumulated cobwebs of British post-World War II economic policy. Almost literally, they are a breath of fresh air. There is an old and rightly discredited idea in economics known as Say’s Law, that in effect supply creates its own demand. It is evidently false, because if it were true it would mean that there were never any gluts of products, and never any unsold inventories of stock. As Adam Smith demonstrated, we do not live primarily in a barter economy; goods are exchanged for a monetary equivalent which then allows the seller to purchase goods. As a result, the producer must first sell his commodity before s/he can purchase. A failure to sell means an inability to purchase. But it took Marx to point out that capitalists may sell a commodity without any intention of purchasing, because they simply intend to accumulate capital which can be used to pay interest or debt, or it may be consumed, may be put into circulation as new products or may be hoarded as capital. For a capitalist enterprise realisation of profit through the sale is the aim, not the subsequent purchase of another product, although in time of crisis even this sale may not be possible. Yet there is a modern and widely-held inversion of Say’s Law even among progressives, which effectively argues that all that is needed in the current investment-driven crisis is to increase ‘demand’ (by which is generally meant consumption) and supply and investment will follow. While reversing Say’s Law this notion reproduces its fundamental errors. It rests on the assumption that the economy tends towards equilibrium; all that is needed is the occasional stimulus to demand. As a result, it has no explanation for the crisis itself, other than irrationality (of businesses, or of policy makers, sometimes supplemented by greedy bankers). It entirely ignores the role that profit has in determining business ‘purchases’, that is investment. As a result, it cannot explain why demand or consumption may rise, but investment can still stagnate or even fall. This is important because it describes the current situation. 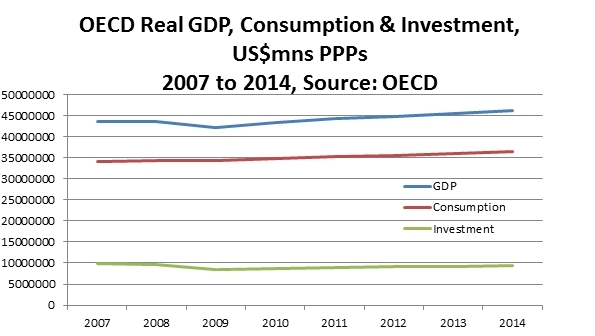 Consumption has risen since the crisis, but investment has not. Fig.1 below shows the level of real GDP in the OECD as a whole since before the crisis to 2014. Real consumption (final consumption expenditure) and real investment (Gross Fixed Capital Formation) are also shown on the same basis. 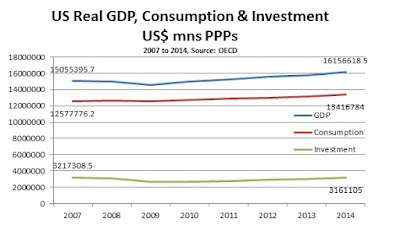 The data are presented in the OECD’s constant prices and constant PPPs (Purchasing Power Parity terms). 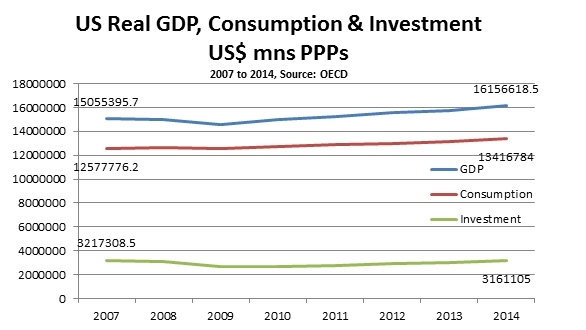 In the OECD as a whole GDP has risen by US$2,663bn from 2007 to 2014. Over the same period Consumption has risen by US$2,320bn. But Investment has fallen by $284bn at the same time. The largest economy in the OECD and the economy held up as the model for growth is the US. It has grown more strongly than many other large economies in the OECD area in the recent period. But the same pattern is evident. This is shown in Fig.2 below. In the US real GDP has risen by US$1,102bn over the period 2007 to 2014. 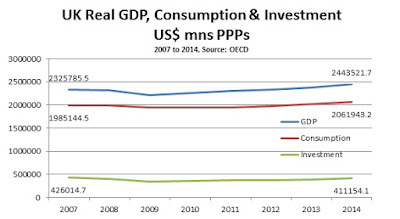 Of this US$839bn is the rise in Consumption but Investment has fallen by US$56bn at the same time. 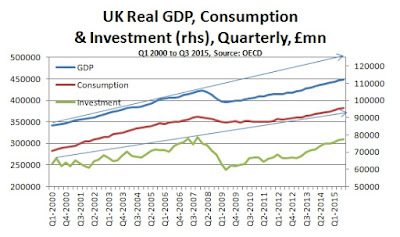 For reference, the same data is show for the UK economy in Fig.3 below. These results are tabulated below, along with the same data for the Eurozone and the Japanese economy. With the exception of the Eurozone, GDP has risen in all cases and has risen in the OECD as a whole. But even in the Eurozone, Consumption has risen. Yet in no case had this led to an increase in Investment over the time period. This will not remain the case forever. At a certain point Investment will recover its previous level before the crisis. In most cases Investment is already somewhat above its crisis low-point. 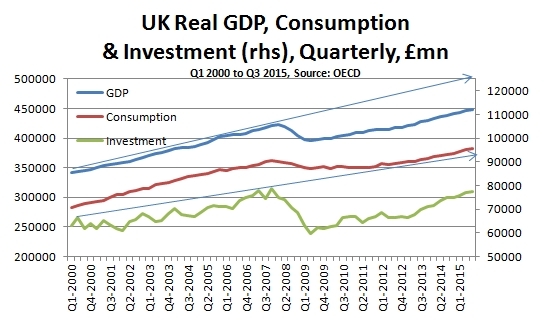 But Consumption is everywhere above its pre-crisis level and has not produced a recovery in Investment. In consequence, in every case the proportion of GDP directed to Invested has declined. As SEB has previously shown, a high or rising proportion of Investment is necessary for high or accelerating levels of GDP growth. As investment in the OECD and its component economies is low and declining, the rate of GDP growth will in general continue to decelerate. It cannot be argued that Consumption has not recovered. Yet Investment has not recovered. 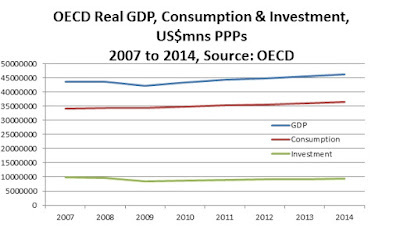 Policies aimed at increasing ‘demand’, by which is meant increasing consumption, will not by themselves lead to increased investment, as 7 years of crisis in the OECD demonstrates. To increase investment, it is necessary for the state to increase it as the private sector has shown it cannot or will not do so in the current circumstances. A key component of that will be a National Investment Bank, and the Labour leadership is right to focus on this. A NIB will allow the public sector to direct investment and to a certain degree to determine its scope. It will so allow the public sector to reap the rewards of the investment it is funding and thereby allow for both improving government finances and further increases in investment. Osborne had a completely phoney Green Investment Bank which was starved of funds. Labour will have a genuine one to raise the level of investment, and therefore growth and living standards. Relying on increased Consumption to produce a rise in Investment has been tried and failed. This is because demand does not create its own supply. Increased public investment is required and a National Investment Bank is a key mechanism for that. The following article appeared in Spanish in Ecuador’s El Telegrafo on 19 December. In the later part of the 20th century Latin America suffered an economic catastrophe from neo-liberal policies. Until 1993 average per capita GDP in developing Latin American economies remained below 1981 levels. By 1998 annual average per capita GDP growth was still only 0.9% – taking a five-year average to remove cyclical fluctuations. Only after Chavez was elected Venezuela’s President in 1998, followed by other left wing Latin American leaders, did economic growth seriously accelerate. By 2007 annual average per capita GDP growth in Latin America reached 2.8%, again taking a five-year average, with faster growth in key countries – Ecuador 3.4%, Venezuela 5.7%, Argentina 7.7%. After 2007 economic growth slowed due to the international financial crisis but remained positive across Latin America as a whole – unlike the decline under neo-liberalism. It is therefore threatening economically that right wing forces won Argentina’s recent presidential election, Venezuela’s legislative elections, and are attempting to impeach Brazil’s President. Although forces supporting these shifts present themselves as ‘centrist’ for political propaganda purposes this is merely disguise. Their economic programmes represent a shift back towards neo-liberalism. As these policies produced economic disaster not only in Latin America but elsewhere it is serious that such forces have reacquired support in Latin America. The present author is based in China but follows events in Latin America closely and has travelled there including twice for conferences with President Chavez personally. It may therefore be useful to have observations from this experience comparing China and Latin America. The truly great historic achievement of Latin America’s left governments was their ‘revolution in distribution.’ During previous periods of rapid Latin American growth the financial benefits went overwhelmingly to better off layers of the population while a large part went abroad. The left wing Latin American governments ensured that this time the benefits from Latin America’s growth went to the majority of its population. But in comparison to China, the difference was that despite this huge achievement, some of these governments did not successfully make a ‘revolution in production.’ For nearly four decades China’s economy grew at over 8%, taking it from one of the world’s poorest countries to the threshold of a ‘high income economy’ by international criteria. This was the largest ‘revolution in production’ in human history. Contrary to US myths China’s growth did not benefit chiefly the rich but ordinary people. China lifted more than 728 million people, greater than Latin America’s entire population, from World Bank defined poverty. The ‘China model’ did not eliminate the private sector but made state investment the economy’s driving force - with the private sector benefitting from the resulting growth. Latin American governments such as Ecuador have begun to move towards this. But those economies which achieved a ‘revolution in distribution’ without a ‘revolution in production’ faced difficulties deal with the new problems in the global economy – facilitating the right’s comeback. For economic success study of China’s ‘revolution in production’ therefore needs to supplement the ‘revolution in distribution’ of which the Latin American left is so justly proud. Britain is a very frequent participant in US-led wars. This stands in contrast to many other European states ranging from countries such as Sweden, to Spain, to Italy and Germany. The piece below examines the material reasons for this difference, and explains British politicians’ determination to join in US military adventures. The widely held view that Britain’s contribution to an air war over Syria will make no significant change to its outcome also made little impact on the parliamentary vote for war. Military insignificance is even accepted by many advocates of action. Former Tory Defence Secretary Michael Portillo argues this boldly telling ‘This Week’ that Cameron had made no case for war, the arguments were flimsy and that there seemed to be no strategic plan. Nevertheless Portillo was in favour of war, saying that otherwise “the US will begin to regard Britain as an unreliable ally”. It appears that many MPs on both sides of House of Commons share this approach. The question of Britain’s relations with the US has long been uppermost in the considerations of strategic policy making in Britain. The term ‘special relationship’ was itself coined by Winston Churchill after Britain’s failure to develop independent nuclear weapons technology. As such it is a sign of both Britain’s relative weakness and its resolve to participate in the US’s efforts to act as the sole global superpower. This determination to act alongside the US is not simply reactionary nostalgia or imperial delusion, although these factors naturally play a role. There is a strong material reason for many British politicians’ eagerness for war, irrespective of the outcome. At the same time, there is a strong reason for all progressives, all socialists and all those who simply want to sustainably raise living standards to oppose those wars. The economically weakened imperialist powers, led by the US with Britain and France playing the role of aides-de-camp, are obliged to become more vicious and militaristic. They require continuous military operation in order to enforce those inflows (as well as favourable trade agreements, strategic military outposts, below market price contracts for raw materials and so on). Naturally, Japan and Germany benefit from this overall system but are not motivated to lead it since ordinary contract law enforcement will secure their positions. Within this overall framework the British case is a specific one. It is the first of the imperial powers to register a persistent trade deficit and then the first to switch from being a net creditor nation to being a net debtor. These are both milestones in and contributors to Britain’s historic decline as an economic power. Britain has experienced the most spectacular decline within the imperialist bloc. Contrary to widespread assertion the British economy is now the tenth largest in the world (World Bank pdf). Britain’s weight in the world economy has undergone a spectacular relative decline over the long-term, as shown in Fig.1. 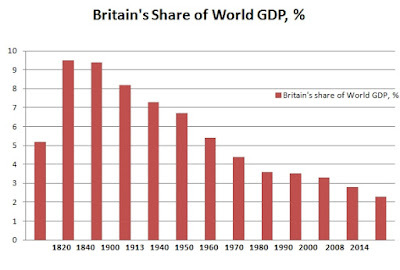 Maddison records Britain’s share of World GDP as 9.5% in 1870 and 9.4% in 1900. It is likely that there was a higher peak at some point between those two dates. As Fig.1 shows the weight of Britain’s economy in the world had halved by the mid-1960s, perhaps over a period of 90 years or so. According to separate World Bank data it has halved again in about 45 years since. So, in 2014 Britain accounted for just 2.3% of World GDP. While the weight of the imperialist countries in the world economy has declined since the 1950s, Britain’s decline has been taking place far longer and is the most pronounced of all. A key factor in that decline and a product of it is the structure of the British economy, with a very large financial sector and an industrial sector which has declined in relative terms for over a hundred years. (The industrial decline is now also absolute. Industrial production was lower in October 2015 than in the same month in 1988). Formerly, the finance sector sucked up uninvested savings generated in the British economy and invested them overseas. This is the export of capital identified by Lenin. This was subsequently replaced with sucking in savings from the rest of the world and investing them globally, making a financial return on the difference. 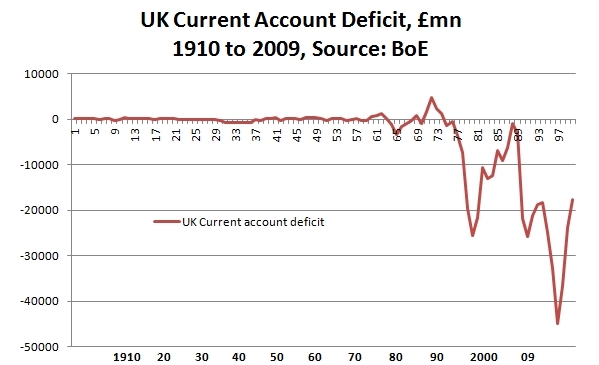 Fig.2 below shows the UK current account balance over time. The current account is comprised of net trade flows (exports minus imports of both goods and services) as well as the net flows of interest and dividend payments between Britain and the rest of the world. 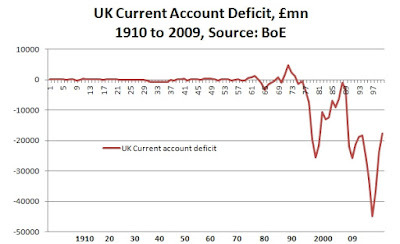 According to Bank of England data the British economy first registered a deficit on trade in 1876. But persistent trade deficits did not appear until the period immediately prior to the First World War. However persistent deficits on the current account did not appear until the period immediately prior to the Second World War, 25 years later. This is because in the interim Britain continued to receive a very large net inflow on interest payments. This component of the current account, the Net Investment Income balance is crucial for understanding the latest phase in the trends in the British economy. It also directly impacts on British policy making, which will be discussed below. But the first effect of persistent deficits on the current account with the rest of the world is that they must be covered by incurring debts or the sale of assets. This rundown of overseas savings has taken place over a prolonged period since the approach of the Second World War. The initial effect was a rundown in the net balance of overseas assets versus overseas liabilities, which is recorded as the Net International Investment Position. This was then followed by a further rundown of overseas assets and a decisive switch from being a net creditor nation to a net debtor, as shown in Fig.3. The UK economy only definitively became a net debtor economy in 1995, 60 years after it first began to accumulate current account deficits. Prior to that point and boosted by the revenues from North Sea oil in the 1980s it registered its largest modern level of net assets in 1986. But that windfall was frittered away with the disastrous consumption binge of the ‘Lawson Boom’. It is important to note that there was a further one-off spike higher in net assets in 2008. This was directly linked to the banking and financial crisis. UK banks had expanded enormously overseas through leverage, or borrowing. They repatriated many of those assets at a loss in 2008 in order to avoid bankruptcy and have continued to wind down overseas assets since. At the same time the overseas loans to British banks were withdrawn. Apart from that spike, the precipitate decline in the Net international Investment Position resumed. This a key feature of how the Global Financial Crisis specifically impacted Britain. The direct consequence of this has been a collapse in Net Investment Income, as shown in Fig.4 below. The UK is not the same as the US. Unlike the US Dollar, the rest of the world is not obliged to hold the British currency in order to meet international trade payments and to service interest on international debt obligations. Within the Empire and then its vestige of the Sterling Area, other countries were obliged to hold British currency. The ‘Sterling Area’ collapsed in mid-1972. 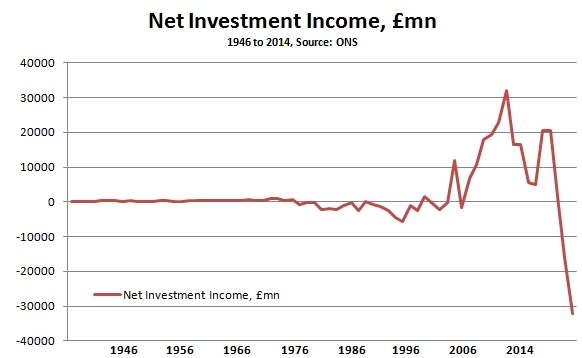 As a result, and combined with the UK’s chronic lack of competitiveness, the interest income account switched to a deficit in the 1970s. This deficit was ‘rectified’ in the 1990s and the early part of this century by the growing role of the British banks in international finance, out of all proportion to the size of the UK economy. This was funded not by domestic savings but by international borrowing. Essentially, the operation was nothing more sophisticated than borrowing from other international banks and speculating on higher-yielding riskier assets overseas as well as on the domestic housing market. The benefit of this inflow accrued mostly to the banks and bankers themselves, and the Blair/Brown government came to rely on the tax revenue from them. The gains from that operation were always a mirage, a stark confirmation of what Marx called ‘fictitious capital’. As recently as 2011 the UK recorded a surplus of over £20bn on the investment income account and by 2014 this was a deficit of £32bn. This deterioration in overseas income of more £52bn represents 2.9% of 2014 GDP. It is an extraordinary slump, and transforms Britain’s ability to extract capital from the rest of the world. The UK no longer has net overseas assets but substantial liabilities. It also has a persistent current account deficit. It is therefore difficult to foresee how this sharp deterioration in the net external position of the economy can be easily reversed. Without a thorough reorientation of British economic policy and the current structure of the British economy there are in effect twin prongs to a recovery programme for Britain’s external financial crisis. The first will be to increase the rate of exploitation at home with lower pay and pensions, worse working conditions and public services. The second will be to increase the rate of exploitation overseas; to participate in the carve-up of nations, to access their basic goods at below-market prices and enforce onerous debts. This is what is meant by British politicians’ determination to ‘be at the table’ when the US judges that the maximum advantage has been extracted from wars or military interventions. An alternative would be to use the remaining strength of the British banking sector, which has been bailed out by public funds, to redirect its lending from speculative activity towards investment in public goods and productive investment. But that would require a thorough-going change of economic policy and structures. Historically there have always been two main trends in the labour movement (as well as a multitude of intermediary ones). There has been an overtly pro-imperialist current almost always willing to support Britain’s wars and only departing from that attachment if the US was opposed (as with Gaitskell and the Anglo-French invasion of Egypt to seize control of the Suez Canal). This pro-imperialist current has always dominated the leadership of the Labour Party and many of the unions. The election of Jeremy Corbyn has changed that. There has always been a minority current inside the Labour Party (though often barely represented in its leadership) who opposed British military adventures, even when they were done in support of the US. The opposition to the actions of British imperialism now comes from the leader of a major political party, one which could form the next government. As such it is an anathema to the interests of British imperialism as a whole. This explains the ferocious and relentless media onslaught on the Corbyn leadership of the Labour Party. Between these two poles lies another broad grouping. This was highlighted in the two recent votes on cuts to working tax credits and the vote on bombing Syria. On the former there was virtual unanimity to oppose the government and vote against the cuts. On the matter of war, 66 Labour MPs voted with the Tory government and a number of others abstained. Irrespective of the confused or contradictory ideas of individual MPs or groups of MPs, these votes reveal three fundamental political trends that have persisted for over a century in the British labour movement. The first is an overtly pro-imperialist bloc, many of whom may now go along with the anti-austerity agenda on a purely tactical basis, such as the Blairites. The second is a bloc led by Jeremy Corbyn which is both anti-austerity and anti-imperialist. There is also a third bloc, which is anti-austerity, but pro-imperialist. The outlook and ideas of this third bloc, like all ideas, spring from material conditions. Marxists understand that those material conditions amount to a separate layer in the labour movement known as the ‘labour aristocracy’. The ideas are what Lenin called ‘Economism’ but which has become known as ‘workerism’. That is a concentration on the immediate economic struggles of the workers and the poor and the relegation of ‘political’ matters, not least war and peace to an issue of second-rate or third-rate importance. In the specific circumstances of British Labour Party politics currently this might be expressed as the view that, while we oppose war it is much more important to unite around the issue of fighting the Tories on cuts. Unfortunately the real world does not allow matters of war and peace to be relegated as if they are minor matters. The one issue that the population as a whole will always place ahead of its own living standards is its own security. The open representatives of imperialism understand this. In his July 2015 Budget speech, where the Tories announced austerity mark II, Osborne mentioned ‘security’ 30 times, more than the mentions of ‘growth’, ‘prosperity’ or ‘deficit’ combined. The intention is clear; to trump discontent over renewed austerity with a claim to offer a belligerent and reactionary ‘security’ agenda. This is also the thread running increasingly through the government’s reactionary ‘security’ agenda on energy, civil liberties, immigration, schools and aid policies. Therefore politically it is not possible to disregard the war offensive, to by-pass it and win on the terrain of anti-austerity. Politics comes before economics. It should also be clear from the economic analysis above that the two-pronged strategy of increasing exploitation at home and increasing exploitation abroad through war needs a two-pronged response. The worker who has her wages cut, or sees bills rise with another privatisation or has her tax credits cut has no interest in Britain pursuing another Middle East war, or in it increasing its military spending, or in renewing Trident. She has no interest in ‘getting a seat at the table’ or Britain’s dubious military ‘successes’. The interests represented at that table will be Britain’s hobbled banks and finance sector. Instead, Jeremy Corbyn and his closest allies are right to oppose both austerity and war and to remain committed to fighting both.